Everything was great except there was no water from 8am to 4pm 2 days out of our 4 day stay. Hotel gave us complimentary breakfast for the inconvenience but we should've been notified before arrival. Other than that property was superb, clean, very modern and super cute! Easy checkin, cool room and perfect for a short stay. Overall it’s a great hotel if you are on a budget. It’s also a good location to get to a bunch of cool neighbourhoods. The property is immaculately clean and well maintained, staff is excellent, price is outstanding value for Manhattan, the room is comfy while "cruise ship" like in efficiency. The common areas are amazingly open and inviting, great for coffee and breakfast, the rooftop bar has plentiful outdoor seating and a great skyline view, and the drinks/food are all at prices below the usual NYC rate! Overall, an excellent, no-frills hotel in a safe neighborhood!! Overall, the hotel was fine, but the checkin process was a complete pain. Guests check themselves in, but there were many issues that required a staff member to help anyways, like if you have more than one room. The last thing you want to do when you're trying to check in with luggage and have just gotten off a flight is try to figure out how to check yourself in, especially when there is an entire desk of people standing there, watching over you struggle. I get what they're going for, but it doesn't work. very cool place in the heart of the Bowrey neighborhood. Great price, too! The staff was awesome. The hotel was very clean, subway was across the street. View from rooms and roof top bar were amazing. Will stay there again. Highly recommend. Good location...very small room, but for such a small space there was a good use of the space. Very cool roof bar and overall vibe. We enjoyed our stay. Rooftop bar is lovely at night. Rooms are tiny but well appointed. 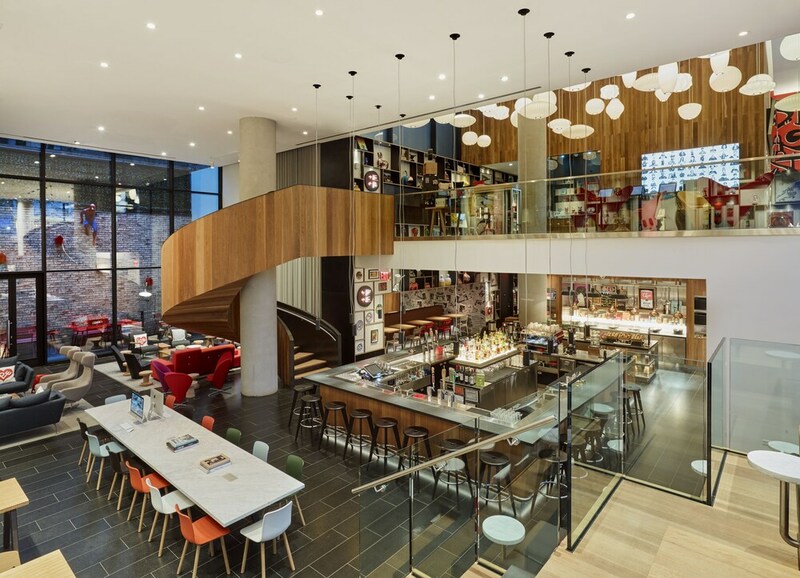 Located in Bowery, citizenM New York Bowery is within a mile (2 km) of popular sights such as Washington Square Park and Union Square. This 300-room, 4-star hotel has conveniences like a restaurant, a bar/lounge, and a 24-hour fitness center. In addition to a meal at the onsite restaurant, you can also enjoy a drink at the bar/lounge. You can get a quick energy boost at the coffee shop/café. Start each morning with buffet breakfast, available for a fee from 6 AM to 11 AM. Guests can expect to find an LED TV with cable channels. The bathroom offers a rainfall showerhead, hair dryers, and designer toiletries. Other standard amenities include an iPad, a safe, and a phone. CitizenM New York Bowery features a 24-hour fitness center, free WiFi in public areas, and microwave in a common area. The 24-hour front desk has multilingual staff ready to help with luggage storage, and answer any questions about the area. Additional amenities include a computer station, a library, and a TV in a common area. CloudM - Rooftop bar. Open select days. CanteenM - Buffet restaurant with onsite bar. Open 24 hours. Open daily. Recreation features at citizenM New York Bowery include a 24-hour fitness center.